Join us for an evening of immigration education. Learn about the issue’s history, how immigration’s national context affects our local communities; hear WNY (im)migrants’ experiences, and how you can work in solidarity with them by joining high-impact, locally-based efforts. Or RSVP to rocrapidresponse@gmail.com to reserve your seat. Please let us know if you are planning on attending and any special requests for the evening. Presenters and Workshops will be announced as they are formalized. Gov. Cuomo: Take Executive Action for Driver’s Licenses Now! Immigrant families cannot wait until 2019 legislative session for protection. It is time for Governor Cuomo to use his executive power to allow undocumented New Yorkers to obtain a standard driver’s license, register and insure their vehicles, and drive safely without fear that simple traffic violation will put them in the crosshairs of President Trump’s anti-immigrant agenda. Sign the petition to demand Cumo take executive action for driver’s licenses now! In recent weeks our country has witnessed an escalation in the Trump Administration’s full-force assault on immigrant communities at the border and at home. Our communities are facing the reality of heightened and inhumane immigration enforcement and no one feels safe. ICE, Border Patrol and local police departments have created chaos in our neighborhoods, courts, schools, and workplaces. Children are afraid that their parents may not come home after work or that ICE might break into their house. Despite the growing support at the community level, the New York Senate and Assembly failed to pass the Driver’s License Access and Privacy Act (A.10273/S.08680) in the 2018 legislative session. For this reason, we are calling on you to be true to your commitment to do everything in your power to stand up to the Trump Administration and protect New York’s immigrant and refugee families immediately. A driver’s license is the most effective protection for many in our communities. In most areas of the state where driving is a necessity, driving without a license is extremely risky and every day leads to deportation. New York’s immigrants are frequently profiled by the local police and referred to Immigration and Customs Enforcement (ICE) or Border Patrol (BP) as the result of a simple driving infraction or routine stop. Those living and working along the northern border of our state are especially vulnerable. Having a driver’s license can serve as a shield to protect New York’s immigrants and keeping families together. We appreciate past measures you have taken for New York to stand in support of immigrant families and against the policies of this administration. In recent weeks, we have seen you take swift executive action on other issues where our legislative bodies have failed. We now ask you to make the New York State standard driver’s license accessible to all state residents regardless of immigration status by issuing an executive order immediately. Immigrant families cannot wait until 2019 legislative session for protection. This petition and campaign is led by The Green Light NY: Driving Together Coalition, representing dozens of immigrant base-building organizations and their allies across the state. For the past two years the coalition has been advocating for legislation that would restore access to driver’s licenses for undocumented New Yorkers, but the legislature has failed to act and will not consider the issue until the 2019 legislative session. This is why our coalition is calling on Governor Cuomo to use his executive power to allow undocumented New Yorkers to obtain a standard driver’s license, register and insure their vehicles, and drive safely without fear that simple traffic violation will put them in the crosshairs of President Trump’s anti-immigrant agenda. We are with Arely and her Family! Join us Wednesday May 16 at 12:45pm in front of ICE Syracuse offices, 401 South Salina St. for solidarity and accompaniment of our friend and member Arely Tomas. Last week Arely’s lawyer was notified by ICE that they were cancelling her scheduled May 30th check-in and requesting her to present herself on May 16th instead so that they could attach an ankle monitor. Her check-in with ICE is at 1pm. Her appointment is supposed to last an hour, we will wait outside until she comes out of the building. We want her to feel the support of the community and to know that we stand in solidarity. Estamos con Arely y su familia! Arely is the mother of three U.S citizen kids, she is a fierce advocate and community leader. Arely and her family live and work in Syracuse, while taking care of the rest of her family back in Guatemala. She was turned over to Border Patrol by the Troopers in 2013 because she and her husband did not have a licence when driving to Ithaca, NY. Despite checking in with ICE for years, recently ICE has changed her phone check in to in person check in and now her most recent check in will result in an ankle monitor. Join us in showing our support for Arely, her family and all those forced to endured these injustices. Domestic violence with the claim that her protected “ social group” was defined as Mexican women who cannot escape violence of a husband. (https://www.uscis.gov/humanitarian/refugees-asylum/asylum ) Because she was only in a civil union, the judge did not recognize her case under that theory. Gang violence and/or the refusal to join a gang. Her claim was based on the murder of her son with two friends after being kidnapped and tortured. Neither Dolores nor Miriam could name a gang, which murdered three people. Because there was no “proof” or clear evidence of gang involvement that theory was also dropped. Dolores was on the stand being questioned by her lawyer for over two hours, followed by ~5 minutes of cross examination by the government’s attorney, who used the above arguments to ruin Dolores’ claim of asylum. Then her daughter, Miriam, quite bravely, was on the stand for 15 minutes with no cross examination. This was followed by a similar experience with her Pastor, Milton Irizzary. In his ruling, the judge actually blamed Dolores for not leaving an abusive relationship and essentially for her son’s death. He also referred to a 2017 study from the Department of State, showing that Mexico now has laws preventing domestic violence and has convicted 11 (eleven) people over the past year. Her attorney will be filling an appeal by June 7 to the Board of Immigration Appeals (BIA), a three judge panel that will determine whether the judge today gave a proper judgment. This will take approximately one year and will most likely also fail But this will be followed by another appeal to the federal courts, which will take over another year to resolve. The bottom line: based on the law, it appears that her case was properly adjudicated despite the ridiculous arguments presented by the judge. She has at least another 2 years before being ordered removed from this country. Thank you to all those who stood with Dolores and Miriam today and to all of you who have expressed concern, prayed for her, and generally wished her well through this trying, frightening, and frustrating experience. Tonight they both seem relieved that this part of the ordeal is over. Drivers Licenses NOW!/Licencias de conducir ahora! The Green Light NY Coalition is mobilizing to Albany to say the time is NOW to pass the Drivers Licenses Bill A10273! The coalition, made up of directly affected community members, advocates, and allies, have been organizing around licenses for years. New York is behind 12 other states and the benefits in public safety, economics and community integration are clear. The time is now to pass the bill and we are calling on everyone in the community from across the state to join us in Albany and send the message to our legislators loud and clear: Our communities can not wait, our economy can not wait, pass the GREEN LIGHT NY BILL NOW! Please contact your local steering committee member if you have questions. La Coalición Green Light NY está movilizando a Albany para decir que es el momento de aprobar el Proyecto de Licencias de Conducir A10273. La coalición, compuesta por miembros de la comunidad directamente afectados, defensores y aliados, se han estado organizando alrededor de las licencias por años. Nueva York está detrás de otros 12 estados y los beneficios en seguridad pública, economía e integración comunitaria son claros. Ahora es el momento de aprobar la ley y hacemos un llamamiento a todos en la comunidad de todo el estado para que se unan a nosotros en Albany y envíen el mensaje a nuestros legisladores alto y claro: nuestras comunidades no pueden esperar, nuestra economía no puede esperar, pasar ¡GREEN LIGHT NY BILL AHORA! Los detalles del evento aún están en proceso. Esta es una campaña de base y recaudamos fondos para garantizar que las personas de todos los rincones del estado que están dedicadas a esta campaña puedan estar en Albany. Solicitamos que las personas se registren y/o hagan una donación en Eventbrite: bit.ly/GreenLightNY5-18 Por favor, póngase en contacto con su miembro del comité de dirección local si tiene alguna pregunta. Hi Green Light Coalition Members! Monday is a huge day for the coalition! We will be moblizating from across the state to descend on Albany and demand drivers licences now! There is still time to sign up for a bus! You can register here today. Please take a second to share the event on social media and/or make a donation to the mobilization! For those of you who have already signed up and/or are driving yourself we wanted to share a few details on the day. (Each location has different departure plans and times so please contact your local lead for more details, if you don’t know who that is I will be happy to connect you.) We will be gathering at Academy Park at 10:30am, there will be a small press conference at 11:30am in the LOB and legislative visits from 1:00-3:00pm. A bagged lunch will be served at the park. On Monday we will share a social media tool kit so we can show everyone our presence in Albany! Please WEAR GREEN to show your support for Green Light! Parking option for cars/vans: Street parking if you wanna risk it! ; or Empire State Plaza Parking S Mall Arterial, Albany, NY 12210 https://goo.gl/maps/H6sWGw3TLq82. There are some benches, but if your groups need to be seated feel free to bring foldable light chairs. Thank you all who have supported this campaign so far, we have 20 assembly members signed on and our support is growing every day! April 25, 2018, Syracuse, NY – On April 18, 2018, organizers from the Workers’ Center of CNY received a frantic call from a dairy farmer, John Collins, stating that just minutes before he had witnessed an unlawful arrest of his employee, Marcial De Leon Aguilar. Mr. Collins recounted how at least seven officers dressed in civilian clothes came to his farm without a warrant and physically assaulted and arrested Mr. De Leon Aguilar in front of his small children, as well as assaulting Mr. Collins and destroying his property. Today, Governor Cuomo held a press conference condemning the recent Immigration and Customs Enforcement raid that took place in Rome, NY. We are thrilled that Governor Cuomo is ready to commit resources to fight the aggressions of ICE in upstate NY. Advocates and community members in Syracuse share the Governor’s outrage. We support the Governor in taking necessary steps to ensure that our immigrant communities are safe, such as his proposed executive order that bars ICE from entering NY State facilities without a warrant. We believe the Governor can even more effectively protect immigrant rights and public safety by reaching out to the local organizations who are documenting and responding first to these incidents for their policy and action suggestions. 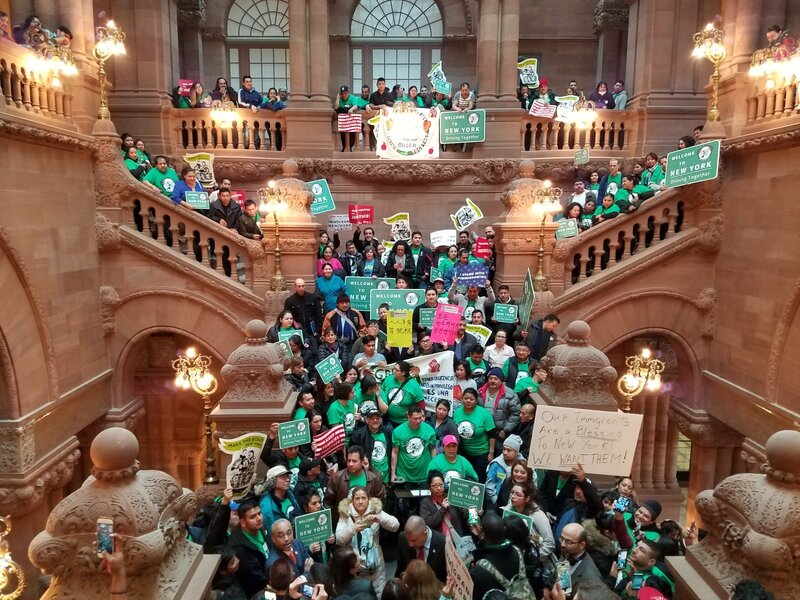 We urge all NYS Legislators and the Governor to support the campaign Green Light NY Driving Together to expand access to driver’s licenses, including to undocumented immigrants. In addition, these groups are highly under-resourced for their work. We strongly encourage targeting funding to these frontline grassroots organizations to ensure that immigrant needs are being met as effectively as possible.